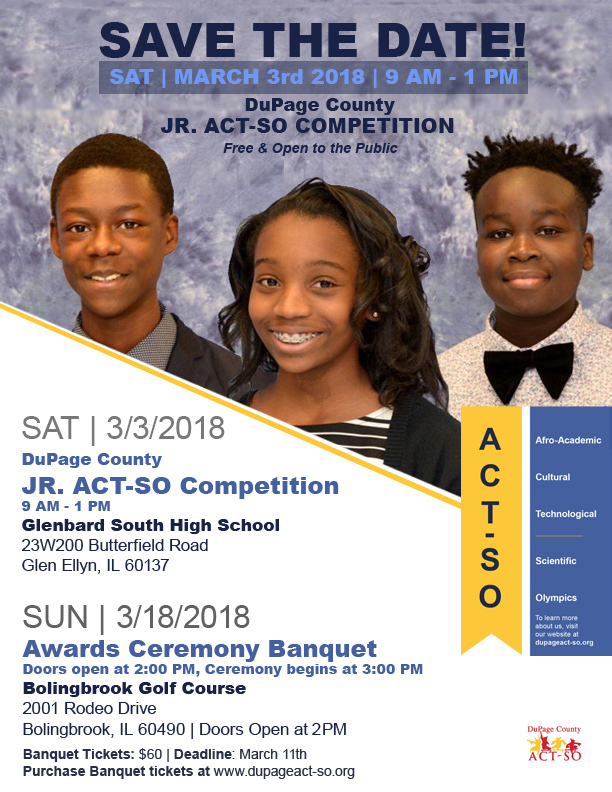 The DuPage County ACT-SO Awards Banquet is a special event to showcase exemplary achievements, and to recognize our ACT-SO and Jr. ACT-SO Students. This gala event is a wonderful celebration of our students and we are looking forward to celebrating and recognizing our students. Join us in celebrating our students who are Committed to Excellence and Destined for Greatness. $60 Per Ticket (no tickets will be sold at the door) / Reserved seating for table of 10. Two (2) Premium reserved family seating drawing for all who complete a table of ten seats. FRONT AND CENTER premium seating. Jr ACT-SO family = seven (7) additional tickets at $60.00 each for a table of ten seats. ACT-SO family = five (5) additional tickets at $60.00 each for a table of ten seats. Families cannot combine their program paid allotted seating for a total of ten seats. Banquet tickets must be pre-purchased by March 4, 2018. Drawing will take place on March 4, 2018. An excellent opportunity for African American High School Students to learn about renewable Solar energy, how to complete a Solar Circuit as well as the importance of Solar power during Safety compromised situations like weather events. Students will also learn about the basics of STEM and how being interested in a career in STEM could help them to be part of the valued workforce of the future. This program is open to African American students ages 13 through 18 who are legal residents of Illinois as of January 1, 2018 with parent or legal guardian permission to enter and participate. Students and their parents can sign up at ComEdSolarSpotlight.com. All submissions must be received no later than February 5. Breakfast, Snack and Lunch will be served during both Saturday’s educational workshops. **Persons who are an employee, director, officer, or independent contractor in any of the following categories, or are the immediate family member of such person, are NOT eligible to participate in the Promotion: ComEd or its parent companies, subsidiaries, or affiliated companies and any entities engaged in the development, production or distribution of Promotion materials or the prizes. Looking for some place to take your family to for vacation this year? Why not take them to San Antonio, Texas, July 11-15! 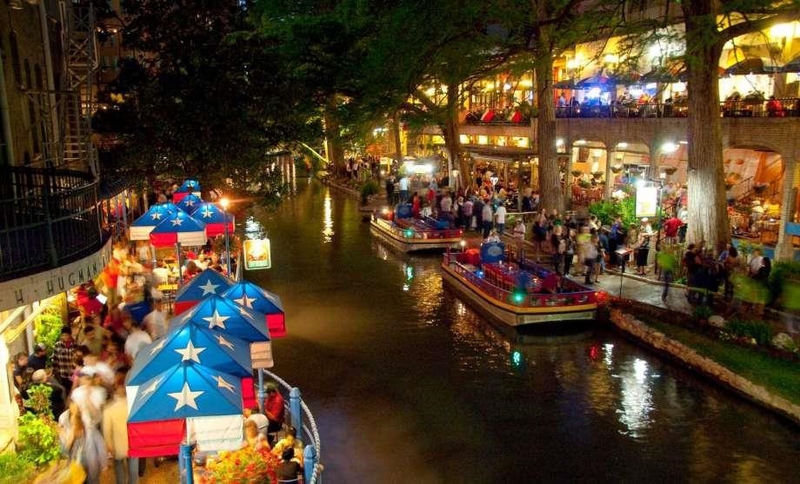 The National ACT-SO 2018 Competition will be held in San Antonio, Texas this year. We will be there with our 2018 Gold Medalists winners and you may want to consider bringing your families as well! There will be 600-800 high school students across America competing at the national level, and it is something to see! 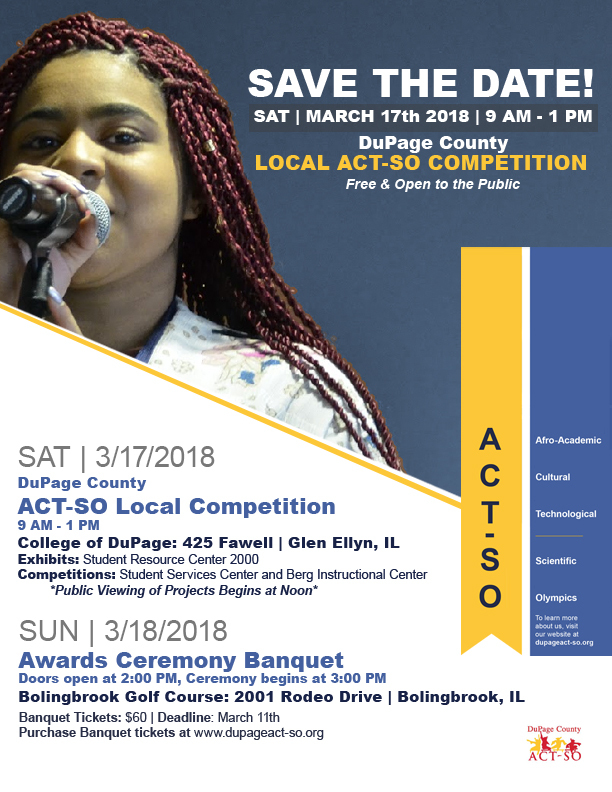 To attend some of the events, there is a cost and you can access more information at NAACP’s 2018 convention site beginning in May.” For more information, please contact Pam Pritchard (National Travel Coordinator for DuPage County ACT-SO) @ ppritchard04@comcast.net. See attached regarding the Fundraising Committee’s participation in the upcoming DuPage Human Race to be sponsored by Giving DuPage. Phinnie Amegashie has registered as our ACT-SO representative. We want as many from our ACT-SO family as possible to participate to help raise funds for our students. The registration fee is $30. If you think you may not be able to participate, you can make a donation in the name of DuPage County ACT-SO. 100% of your donations will go towards ACT-SO. We plan to make a 5-minute presentation at our February enrichment session. Any questions, please email Pam Pritchard (Interim Fundraising Committee Coordinator) @ ppritchard04@comcast.net or Phinnie Amegashie (phinnie@comcast.net). 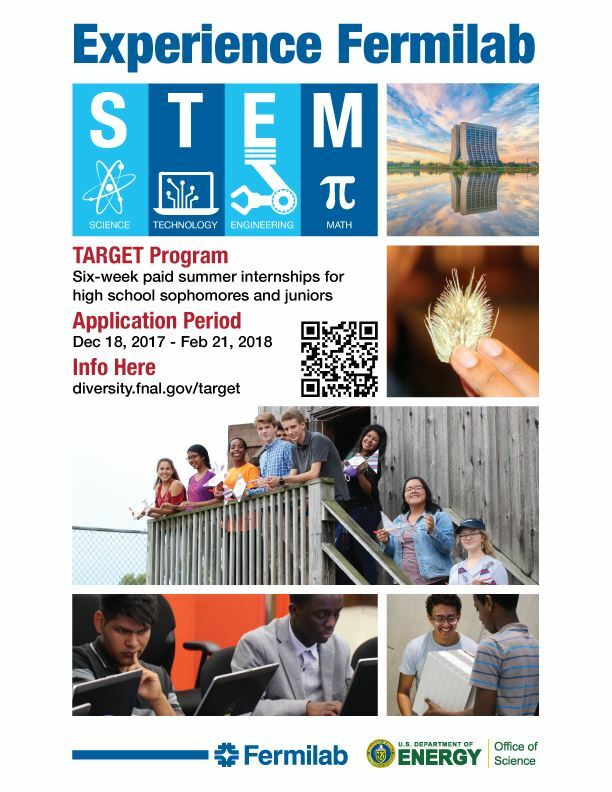 The TARGET Program is a paid, six-week summer internship opportunity for Illinois high school sophomores and juniors who have strong interest and demonstrated aptitude for physics, mathematics, computer science and engineering. The program’s design combines both work and hands-on experiential learning. In addition, TARGET interns are expected to attend lectures and participate in program tours and group activities. The program’s goals are to encourage high school students to undertake college study and pursue careers in STEM disciplines. The TARGET Program supports efforts to increase underrepresented populations in the sciences and engineering at the college level and consequently the workforce. Members of underrepresented populations, including but not limited to African Americans, Hispanics, Alaska Natives, American Indians, and women, are strongly encouraged to apply. * Bonus fact: 2017 National Award Winner, Whitney Ford, completed the 2017 TARGET Program! 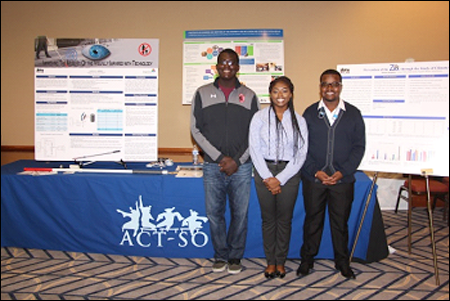 ACT-SO students Allyson Amegashie, Joshua Lambert, and alumni Jalen Crump shared their research in Medicine and Health, Engineering, and Physics with students ranging from Kindergarten to high school and with engineering professionals at the National Society of Black Engineers (NSBE) Professionals Community Impact Project: Innovation Lab on Saturday, September 30. 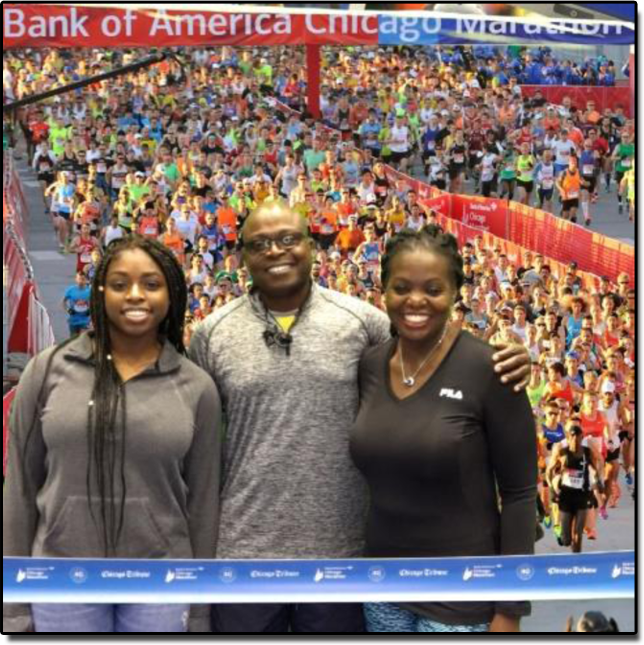 The event was held in downtown Chicago as part of the NSBE Professional Development Conference. All were impressed with Allyson, Josh, and Jalen’s work with several of the engineers surprised when they found that the research was performed by high school students. Our students represented ACT-SO extremely well. We’re sending a hardy thank you to all the facilitators who shared their knowledge during the October 21 Enrichment session. Casandra Talmadge from McDonald’s continued her work with the Entrepreneurship students. Jeremy White helped the Humanities students with tips for getting past writer’s block. The scientific method and constructing an hypothesis was discussed with the STEM students. Alton Rollerson worked with the Oratory students and Wanda Parker worked with the Dramatics students. Cortez Watkins helped Music Vocal and Instrumental students with tips on selecting the right piece to perform. 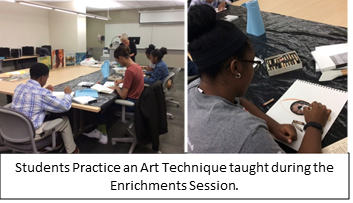 Thanks to Tony Venezia and LeVern Danley who worked with the Filmmaking and Photography students, respectively, and to Andria Smith for recruiting an art professional for the Drawing, Painting, and Sculpture students. A special thanks to Tia Juarez from the Women’s Business Center Aurora, who presented the interactive workshop, Starting a Business 101, which was attended by both students and parents. Several students made positive comments about the workshop. Visual Arts Enrichment is pleased to welcome Ms. Sally Sharp, Director of Education at the Naperville Art League as an instructor to our program. This month students were introduced to cold wax medium techniques and more. Students should review October's homework which focuses on theme. Students should complete the review and email Mrs. Smith potential researched themes by November 15, 2017. The November class will focus on drawing and will feature a live model.